At Insignia we pride ourselves on quality designs and products. This pool is a excellent example of where design and construction by our firm has resulted in the creation of a quality outdoor lifestyle environment by the integration of clever design within the constraints of an existing home. This project transformed a once non accessable backyard into a modern landscaped swimming pool courtyard. The pool is 8m long and 3.5m wide. Interior of the pool is lined with glass mosaic tiles, and the surrounds of the pool are finished in a red earth teracotta tile. 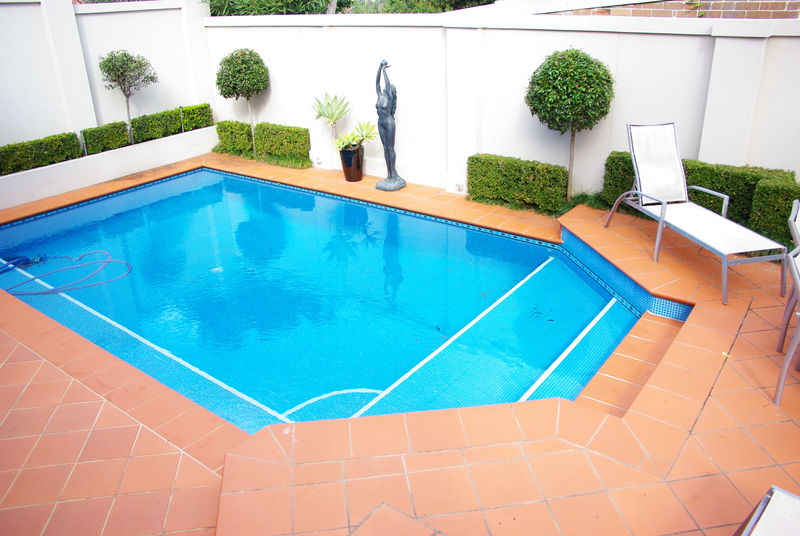 One of the unique features of this pool is that it has shallow, accesible areas surrounding the extremities of the pool. Another feature is the large tread steps which gradually draw you into the pool towards a sit down area which skirts one side of the perimeter of the pool.This allows adults and children alike in waist high water during hot summer days, without having to enter the pool entirely.